6/30 I had spent the past year asking our regular dentist about when it would be time to look at T1's teeth to discuss orthodontia. I could see from how her teeth were coming in that this would be an issue and I had the greater concern that certain tooth and jaw problems are genetic and I had those in spades. In April, I insisted on an X-ray (digital, very easy) and the results were worse than I (or the dentist) had thought possible. Not to go into great detail, but our dentist immediately said that these issues would be far greater than he could handle and we found a Kiefer-Orthodontist who specializes in children (younger than the norm) and difficult cases. We got a relatively emergency appointment (within the week) and brought our X-rays with us (kindly sent by e-mail and carried on a USB stick). The Dr. was also concerned. Although not, she says, the worst case she has ever seen, it is right up there with them. In particular, T1 appears to be missing (among others) an adult tooth which is theoretically not ever missing. We have hope that, perhaps, other teeth may be calcifying away and appear later, but at the moment it looks not good. So T1 is wearing upper and lower plates, sparkly purple and with an embedded Teddy-bear, and she has been super good with them. We have an appointment with a surgeon next week, not because it will be possible to do surgery in the near future, but because the plan of work will span the next 10+ years: implants will not be possible until T1 is between 18 and 20. Here a moment to discuss the difference between the US and Germany in regards to both health care and care for citizens and children. Our top of the line expat insurance carries the usual limitation on orthodontia (including our top of the line dental). We will, of course, take care of our daughters mouth and jaw problems. We would do so even if I needed to go back to work to do so or if we needed to get a loan to do so. The sums will be significant and less than 10% will be covered by US insurance (which we pay for— it's most definitely not free, although subsidized by the German's employer). The amount that we would save in taxes paid if we lived in the US would be greater than the amount we need to pay for the course of treatment outlined. In fact, in the US, the total amount we paid in all taxes (including the amount paid to high tax state NY, but not the (very large) amount paid in real estate taxes) was considerably less than what we pay in Germany. However, here in Germany, no matter what tax bracket one is in, one has health care, and, in the case of severe requirements such as my daughter's, orthodontia (not for pure cosmetics, but for structural reasons and starting at cases far, far less severe than T1's). I prefer a country which believes that children deserve to have structural irregularities taken care of regardless of how much their parents earn. I am happy that our tax dollars go to support this system. The real issue is when one both pays the taxes (like us) and does not receive the benefit (like us). A reason to look into switching into the German public health system when it is available. Skin Trade (2009) by Laurell K. Hamilton: What can one say? It was 1 pound on a table. It's sort of like watching a train wreck (with lots of orgies). Enthralled (ARC 9/20/11)(anth. Melissa Marr & Kelley Armstrong): Short stories by top paranormal authors. Fun. I especially enjoyed the Ally Condie, the Sarah Rees Brennan and the Marr. Magic Slays (2011) by Ilona Andrews: I love this series even more every time I read another book by the husband/wife co-authors. (I love their other series as well, set in the Edge). Great female protagonist, great supporting male lead, great character and world development. Unraveled (ARC 9/2010) by Gena Showalter: Teenagers, vampire girlfriend, werewolf protectors, witches and drainers. I finished it, but I'm not intrigued enough to get the next, or the previous to catch up. A Really Cute Corpse (MDT 1988) by Joan Hess: While in NY in May, I took the opportunity to grab a few more of my mother's mysteries and a few Hess'. I'm reading these out of order, of course, but I can see that Hess is not aging her characters year by year, as the later mysteries I read still have Caron ( Claire Malloy's daughter) as under-aged. A nice mystery, just a day in the life of our hero, the book store owner. Howl Deadly (2009) by Linda O. Johnstone: This series seems to go up and down and this one was just not that interesting. Pet-sitter/lawyer Kendra Ballantyne visits boyfriend Dante DeFrancisco's wildlife sanctuary . A missing wolf leads to a murdered man and some background info on Dante. 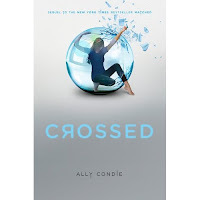 Crossed (ARC 2011) by Allie Condie: I liked this a lot. Alternating viewpoints from the two protagonists. A perfect middle book of a trilogy, leaving me poised for the third. The only problem with having it early (it will be released on 11.1.11) is that I need to wait 17 months to read the final book. My only question is whether I should wait until the third book is out before I send the trilogy to my three nieces for them to read. It's that good. See my review of Matched here. Thing 1 had her first recital and we were very proud of her courage. After having several panic attacks the week before and declaring that she would not perform, she instead practices like mad (without my needing to require it) and did a great job. All the students had the typical German Urkunde afterward, although T2 was too shy to appear for hers. Afterward, she blew off steam playing with her sister in the grounds of the Embassy where the recital was held (a lawn like this— and the backyard— are what we miss most here in Berlin). We visited a new synagogue today and had a great day. Afterward, we went home and went strawberry picking. We were racing the forecasted rain the entire time but in the end, it started raining after we had picked two full bowls, bought and eaten some local cheese and zwiebelbrot and found a DVD at the attached fleamarket. A really nice day. The last month has just been so busy, lots of travel and exhaustion. Lots of fun and some strangely childish adult interactions— do bullies actually still get away with it over 40? I'm not certain if I will append actual posts to these, but at least it shows where I have been for the last month plus so I can think about posting again.